This posting is a gift for a certain clan caretaker and woodworker who is interested in making some of these chests. It is easy to find photos of the exterior. This post is heavy on the visuals and interiors, to help understand the construction technique. Here is one with no painted pigskin on the outside. Nice dovetail details in the corners. Another plain one, no tack holes so we know it never had pigskin covering. Sometimes things that are a little damaged reveal the most about methods of manufacture. The way the corners are done on this one is really nice. Also, you can see how the brass parts are set in…the wood is ever so slightly recessed so the whole surface will be flush after the brass is added. ASM 90-17-1 from Sitka, the Wolf House, Gootch Hit. 1790-1850. One more plain one without leather. Notice how the lock mechanism is similar on the three plain ones. Also, this one seems to have a repaired area on the lid? Generally each side of these chests was a single big plank. On all the chests the lock on the front face is met along the edge with a beveled feature on the wood. Most of the painted ones I have seen are green or red, with perhaps red being more common? The foliage design I have once or twice seen on carved silver bracelets. I guess camphorwood is the equivalent of cedar in some ways, highly aromatic and with an insect repellent quality to it. That would be quite important in keeping pests away from wool robes, furs, feathers, and other elements on regalia that might be at risk for infestation. This one is the baby brother of the two that are on display in the first image. This size is the smallest of the typical sizes, and you’ll see the underside is different. No “feet” on this one. This seems typical of the small ones. 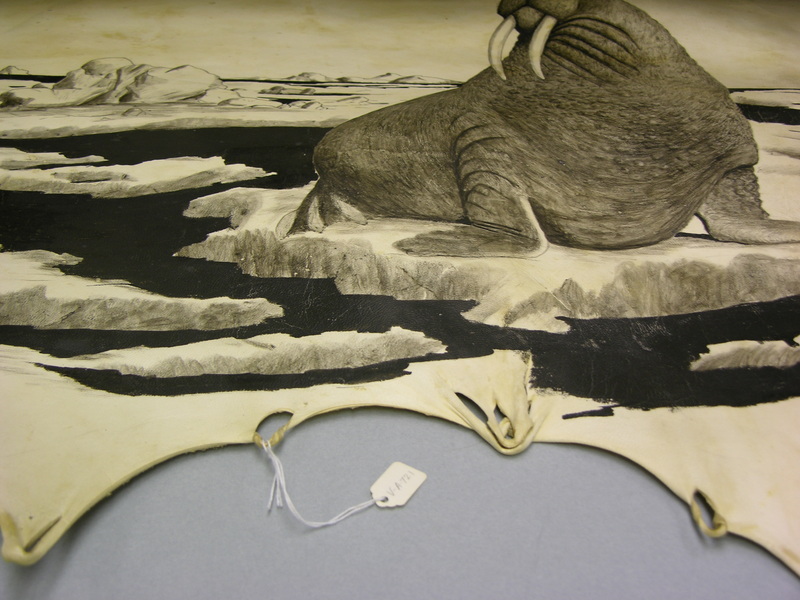 This is the largest one in the Alaska State Museum collection. You’ll see the back is undecorated. That seems typical, too. Front, sides, and lid tend to have the foliage decoration (sometimes including birds) but I have not seen the back decorated. The leather and the wood react to changes in humidity differently, but they are not allowed to move independently because they are tacked all together by the brass tacks and trim. Consequently, almost all of these pigskin-covered chests I have seen have extensive tears in them. Treatment-wise, the most straightforward repair would be to insert a layer behind the tear that would match, and tack the edges to it as best as possible. The chain on this one is not original. Typically they have hardware like the previous one. As the Alaska State Museum gears up to move out of its old facility, we’ve been busy ordering and consuming supplies to ready collections for the move. When you have a choice about what material to use in a given application, which one is more economical? For the new staff, volunteers, and contractors…what materials are we talking about? 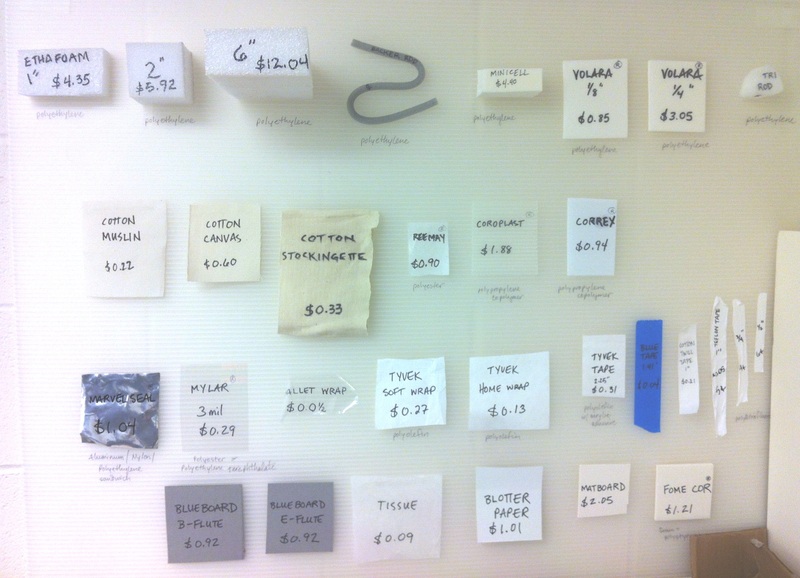 I put together a sample board of products and how much they cost per square foot, mounting the items with hot glue on a sheet of Coroplast and hanging it on the wall above one of the workstations where people are making storage supports. I’ve also got a list of what we’ve been using in summer 2013, where it comes from and how much it costs per square foot. Remember, we’re in Juneau, Alaska. Yes, we are the capital city but we are not on the road system. Everything comes here by boat or by airplane. Shipping costs are a big deal. How to calculate square feet: multiply L x W in inches, then divide by 144 (12 x 12 is a square foot). Then visualize and imagine if that makes logical sense. Our collections room floor tiles are one square foot. I have a bigger spreadsheet that breaks out columns for how much product and what the shipping costs are, but just posted the conclusions in the table above. Home Depot Tyvek is Homewrap, not needle punch softwrap, and has words printed on it. Valley Lumber carries Tyvek Homewrap, too, but it costs more. Beware: “Tyvek tape” we want is made of white Tyvek carrier, not the kind of clear carrier tape that is used to tape Tyvek to Tyvek. If you’re curious about what all these products are made from and what museums use them for, check out the excellent website CAMEO (Conservation & Art Materials Encyclopedia Online), a searchable inormation resource developed by the Museum of Fine Arts, Boston. Tri Rod is no longer on the market, replaced by trapezoidal rod from University Products. However, it looks from images on the web that it might not have the smoothness on all exterior surfaces that we like. We ordered some and will evaluate. Local sources include Alaska Industrial Hardware (AIH), Home Depot, Valley Lumber, Good Hardware, and JoAnne Fabrics. The State of Alaska has a contract with Fisher Scientific, which includes a discount and free shipping. This is a huge savings for us. Our local source for affordable Corex is a sign printing company for where our exhibit designer AJE used to work. Technically, we should call this stuff Corflute sheet, as Corex is the manufacturer who makes this twin walled polypropylene sheet. but the local sign company we buy from calls it Corex, so we’ve fallen into the habit too. While I’m at it, I might as well mention my flagrant abuse of the term “Ethafoam” here too…we tend to use it for any good quality polyethylene foam we use, much in the same way folks might say “Kleenex” for a different brand of facial tissue. Talas, Metal Edge, Daniel Smith, MasterPak and University Products are vendors with an online presence that are often used by museums. We have found them the most cooperative of the many vendors available when it comes to Alaskan shipping issues. IR Specialty is a specialty foam company in Fife, Washington that also has a website. Conservation Materials Limited was a conservation supply company run by Doug and Dorothy Adams. This business was important to the development of the conservation profession, and put out several newsletters which are of interest to us today. 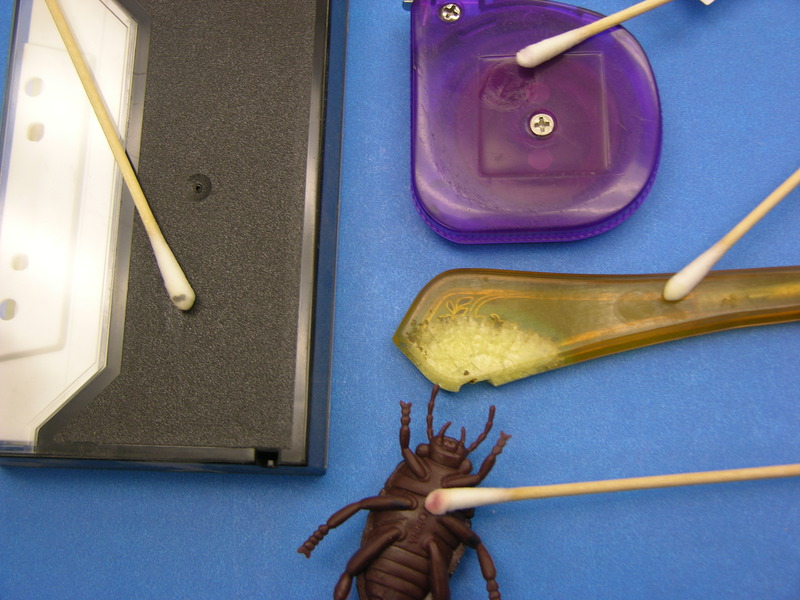 I believe every treatment report should have a “rationale” section in it, to explain choices conservators are making. Sometimes it is necessary to sleuth out those past choices today, for either research or current treatments. Here are pdf scans of the old CM Times newsletters, which contain both useful information and are still an interesting read today. I was looking into this company to date some supplies in my lab (see posting called Dating Conservation Supplies) and thought this would be worth sharing too. Below the pdf scans is a best-guess timeline of the company. Corrections or additions most welcome. 1994, May 20: Douglas Adams died in a car accident, Dorothy continued the business. Many conservators wrote their remembrances of Doug in the WAAC Newsletter Vol 16 No 3 September 1994 page 5. 1997: Out of business. Dorothy Adams apparently started a similar business, but sold it in July 1997. 1999: Conservation Materials Limited used to make Quake Wax, but rights to the product were acquired in 1999 by Trevco, Makers of Quakehold! Museum Wax, Clear Museum Gel and Museum Putty. 2004: Flurry of distlist email rumors about Conservators Emporium being out of business or lagging far behind in their orders. Owner William Foster writes in July of 2004 to say he has $30,000 in unpaid receivables and the business is struggling. 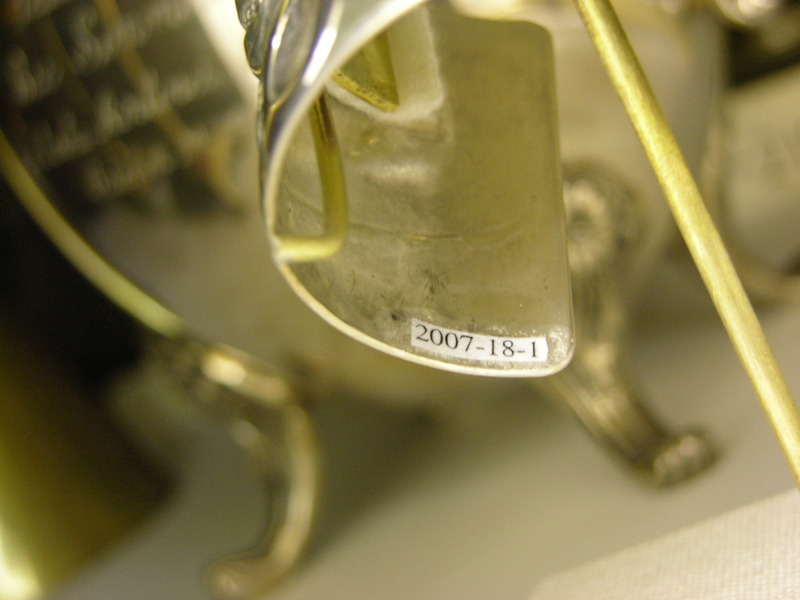 Sold to MuseuM Services Corporation in 2005. 2005: Peter Mecklenburg of MuseuM Services Corporation announces that it acquired Conservator’s Emporium as of November 1, 2005. New location is 385 Bridgeport Drive, South St Paul, Minnesota. 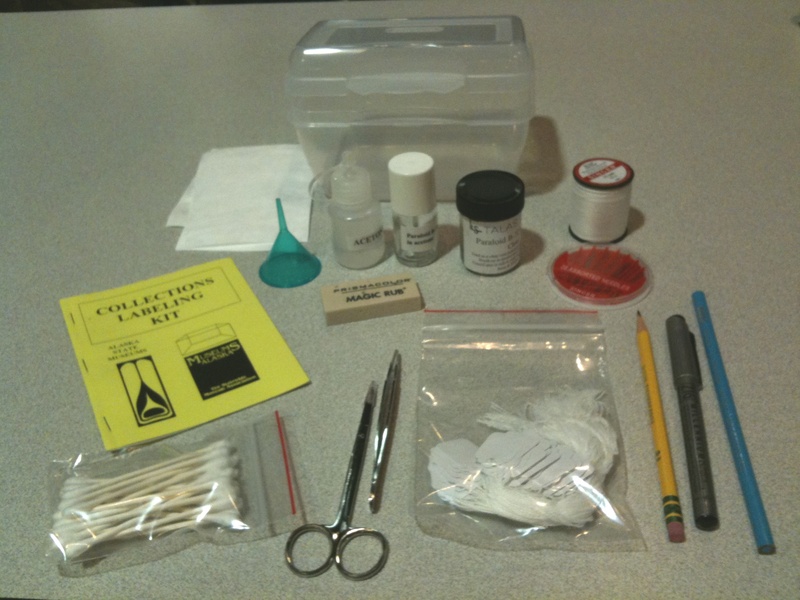 This is the kit I made for a workshop at the Museums Alaska conference in Valdez, September 2011. The kit is designed for small museums with wide-ranging collections with everything from natural history specimens to fine art, where limited staff must wear many hats. I made 24 kits, since many things can be ordered in a case of 12, and each kit cost about $50. The workshop was funded through a grant from the Alaska State Council on the Arts. The kit includes a manual, which can be found at the posting Collections Labeling: Material by Material. Other adhesive choices can be found on the posting Collections Labeling: Alternate Adhesive Testing. Hardware store acetone has petroleum distillates, other impurities. Will work, but may make paper translucent and hard-to-read on dark materials. Could behave unpredictably with B-72. Acetone is main ingredient in nail polish remover. Fumes may be irritating. Think twice about rubbing solvent on the surface of your artifact. For transfer of adhesive into smaller brush bottle, like polish bottle. When B-72 dries on tools or jars, it can be soaked in water overnight, and then peeled off. Sharps are good for piercing Tyvek label, but could stab through fibers. Blunts or ball points are good for getting in between the weave gently. Cheaper needles often have poorer quality “eyes”. Use to apply the paper label. Synthetic acrylic resin: 70% ethyl methacrylate 30% methyl acrylate copolymer. Works best no thicker than maple syrup most of the time. Even thinner is often fine. If you want to mix B-72 yourself, Howard Wellman describes how on the SHA website. Soluble in acetone, but does not go into ethanol easily. Ethanol sometimes added to slow drying time. If it bubbles, try adding more acetone to your jar of adhesive. If the top coat smears the writing, try loading brush well and applying in single thick stroke. If it still smears, could try artist acrylic gloss medium as a top coat, applied smaller than barrier coat. B-67 is similar to B-72 but in mineral spirits instead of acetone. This is sometimes used a top coat. Aquazol is sometimes used to coat or size the label paper first, making the ink less likely to smear. B-72 is thermoplastic, so if the lid sticks, running under hot water or using a hairdryer can help get it unstuck. Use this pen for writing on tags and Tyvek. “Permanent” boasted by many pens often just means waterproof, not lightfast or non-bleeding. Carbon black ink is lightfast: India ink or rapidograph ink. Quill pens take practice, can be gloppy, sharp, and may scratch. Technical pens are fussy (clog, need cleaning fluid, delicate tip, may scratch). IdentiPen also recommended for writing on plastic bags. Helen Alten has a good article about testing pens for artifact labeling. HB pencils are also OK. Wonderfully reversible on many surfaces, especially paper, if you don’t press too hard. Use these for marking the back of photos printed on plastic. If you have a plastic photo, the right balance of sharp/dull regular #2 pencil may work if the plastic isn’t greasy from fingerprints or plasticizers. Nail polish is no good…yellows, cracks, peels, ages poorly, crosslinks. Remember, how long is it meant to last on your fingernails? Correction fluid or Wite Out is also not OK, it peels off too easily, ages poorly, proprietary mix varies widely. Nice to buy B-72 already made, but the wide lid container causes it to dry out too fast. Use mini-funnel to transfer from bigger container into polish bottle. Also, if one jar dries out you have a back-up. When applying, think of a sandwich made by two layers of B-72 with label in the middle. Cut your labels into fringe for ease of handling multiple small numbers. Rounding the corners makes labels less likely to snag and pop off. Sewing scissors work well for this use, too. Don’t use colored string. Sometimes it runs or bleeds. Replace with white string. 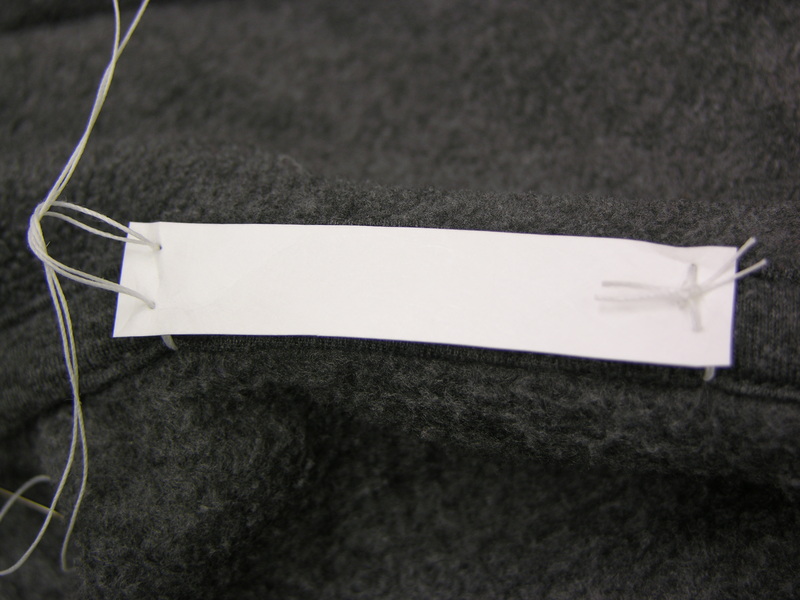 Avoid tags with wire, wire edges, or metal grommets around holes…risks of scratching and rust stains. If your budget permits, you might want to upgrade to artifact tags from archival supply companies. However, these are about 13 cents each as opposed to 1 cent each for the Avery brand office-supply variety, which test slightly more alkaline (pH 7-8) than the expensive ones (pH 6-7). Both come with white cotton string. As thin as will go through your printer or photocopier. Might need to experiment with feed. Write the method that will work on your equipment on the cover of the folder you keep paper in. Some Japanese tissues may be too thin to print, or may get translucent with adhesive. Snipping your list of numbers into fringe helps keep track of tiny labels. Manipulation by curling over the fingernail to conform to curves or folding lengthwise for long items. Rule of thumb, tie material should be softer than the object, so abrasion will damage the tie and not the artifact. Cotton is non-abrasive. Polyester is a little bit abrasive. Don’t use with beads that have glass disease, it may help wick moisture inside. “Glide” or other brands of Teflon dental floss OK. Plumber’s Teflon tape is OK. Regular dental floss not so good. Usually made of nylon and ages poorly, becoming brittle and breaking. Plastic zip ties usually too rough, and are also usually nylon and degrade, get brittle, break. PVC plastic degrades and releases acids. Pointy ones are helpful for manipulating paper labels. Tyvek is spun-bonded from olefin fibers, an inert plastic. Mailing envelopes and home wrap are usually Tyvek and it is OK to use the non-printed, bare areas. Needle punch “soft” Tyvek and smooth “hard” Tyvek both OK. Alternatives: twill tape, Reemay. Twill tape sometimes hard to write on without ink bleeding. Can be helpful for removing tape residues from price tags or stickers as well. Alten, Helen “Numbering Museum Collections: Labeling Ethnographic Objects.” ICOM Ethnographic Conservation Newsletter Number 17, April 1988 pp.18-21. Braun, Thomas J. “An Alternative Technique for Applying Accession Numbers to Museum Artifacts.” Journal of the American Institute for Conservation Vol 46. Summer 2007. Pp 91-104. Wellman, Howard “Mixing Resin Solutions.” Society for Historical Archaeology website 2006. This is the manual included in a kit I made for a workshop at the Museums Alaska conference in Valdez, September 2011. The 2011 workshop was funded through a grant from the Alaska State Council on the Arts. The kit is designed for small museums with wide-ranging collections with everything from natural history specimens to fine art, where limited staff must wear many hats. 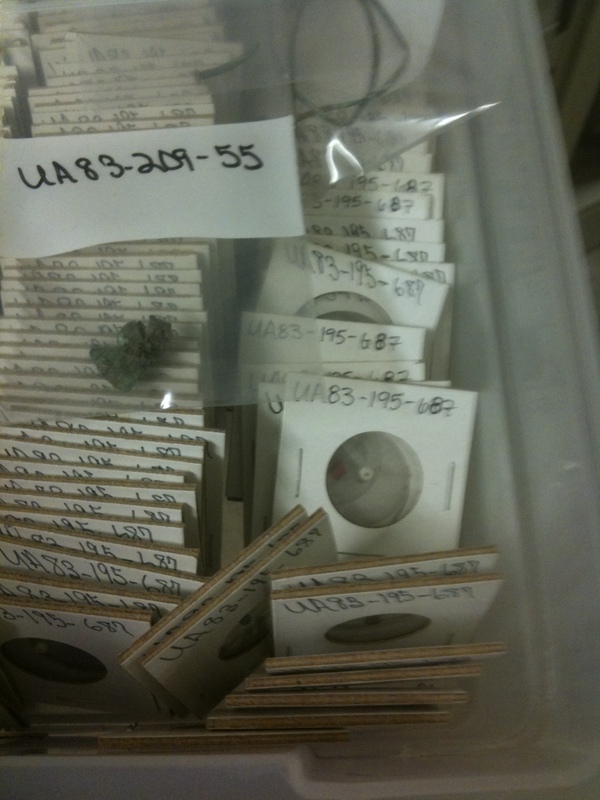 My preferences come from (1) labeling thousands of artifacts while I was a curator at the Juneau-Douglas City Museum and (2) providing outreach assistance to museum staff statewide in Alaska who need easy simple solutions to collections management issues. In general, I follow the paper label technique described by Thomas Braun in JAIC Summer 2007. The text below is from the little manual I enclosed in each kit. If you want the little manual, just print out this manual for collections labeling , cut it in quarters and staple it together. The contents of the kit are listed and explained in the posting Collections Labeling: Simple Kit. Some adhesive choices are described in the posting Collections Labeling: Alternate Adhesive Testing. 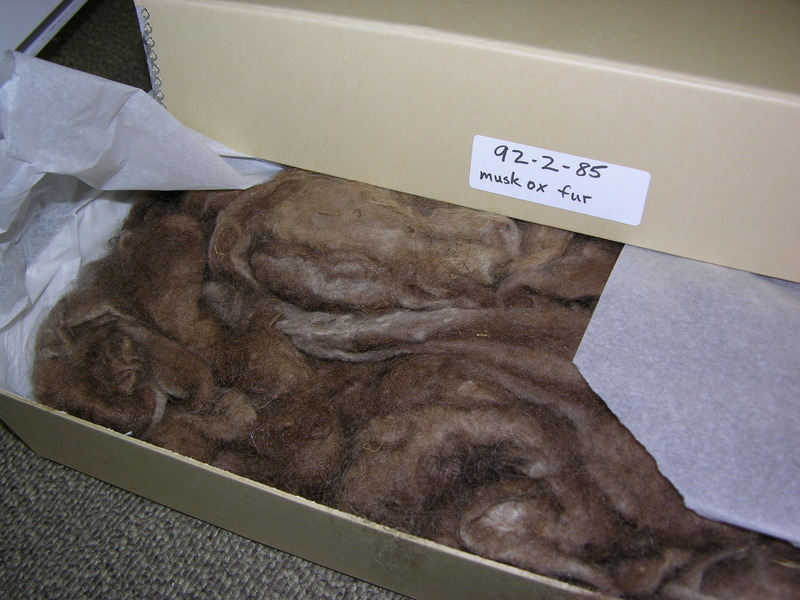 Here's a labeling challenge: a box of muskox fur! 1. Will applying this label cause damage such as new holes or dissolving the surface? 2. Will future removal of this label cause damage? 3. 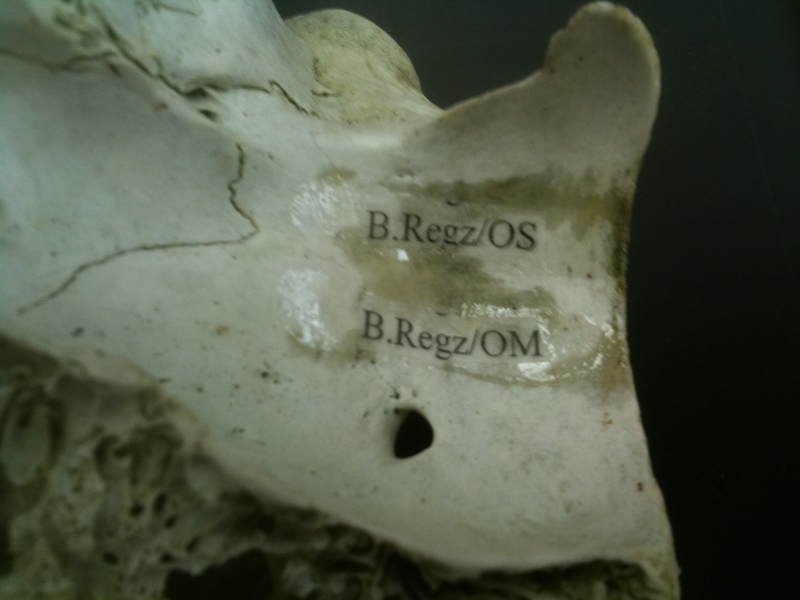 Will the labeling materials run, fade, abrade, corrode or age in a way that will damage the artifact? 4. Is the label readable? 5. Is it easy to find the label without having to handle the object a lot? 6. Is it easy to hide the label during exhibition or photography? Is the label ugly? 7. What will happen if the label gets wet? 8. Is the label likely to come off with normal handling, running, or abrasion? 9. 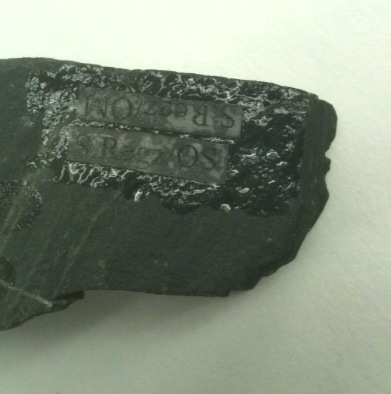 Is there a compelling and urgent reason to remove any existing labels that may be important to the history of the item? Locate a smooth area that is not flaking, powdery or decorated. Choose a location that will not show during exhibit or photography. Apply base coat of B-72, paper label, top coat. Use paper tag, labeled bag/ box as redundancy and to reduce handling. Sometimes the tag is the redundant label on a basket, sometimes it is the only label. Typically, the underside of a basket is labeled and the inside of the lid, if present. For baskets with very large elements, like cedar bark mats or bark containers, apply base coat of B-72, paper label, top coat. 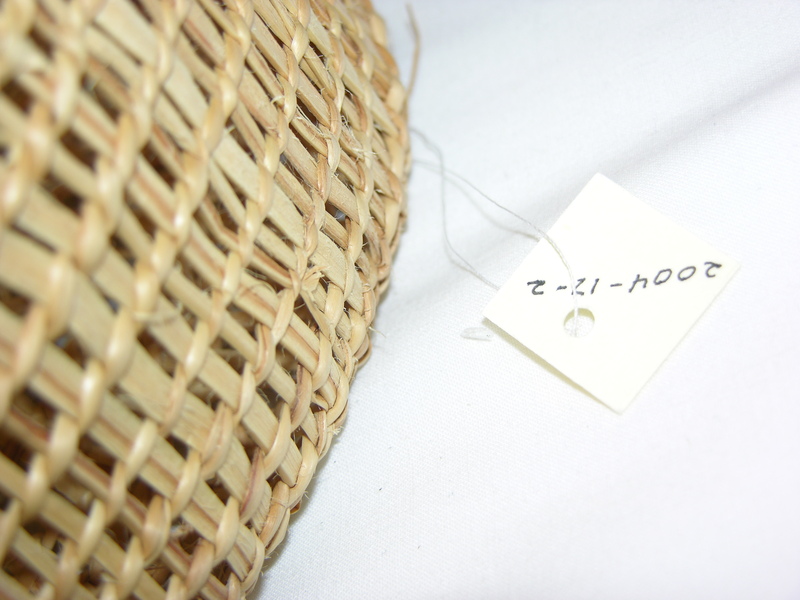 For baskets with a finer weave structure, do not use adhesive but instead a small hanging tag sewn in between the weave with a needle that may pass through easily. Use labeled bag/ box as redundancy and to reduce handling. Redundant label on the folder means less handling for the item itself. Inside cover and reverse of title page are the common places to mark a book. Writing on the top outer corner means the book doesn’t have to be opened all the way. Number is usually applied to the back upper right corner of a sheet of paper such as a document or a print/drawing/ watercolor. Apply number with a #2 or HB pencil, taking care not to press hard enough to make indentations. Write on a firm surface. Use a labeled bag/ folder/ box as redundancy and to reduce handling. Insert an acid-free paper bookmark with number in pencil at the top to fragile books. Typically, the underside of a ceramic is labeled unless it is unusually large or heavy, and then a place is chosen low on the “back” side. Locate a smooth area that is not flaking, powdery, painted or decorated. The smooth, hard, shiny exterior of some pottery, called glaze, is made of glass and can be labeled. Beware painted surfaces and do not mark or adhere onto them. Do not mark break edges of sherds. Choose a location that will not show during exhibit or photography. Do not obscure maker’s marks on base. It is possible to safely label leather and gut, but I consider it a more advanced skill set and generally recommend a paper tag. Feathers of significant size may be labeled on the quill with a small font paper label. Most feather and skin artifacts have delicate surfaces and the removal of an adhesive label will leave a stain. Many feather and skin artifacts are connected to composite objects with other parts that may be labeled instead. Some feather and skin items are sewn and a Tyvek label sewn through original stitch holes with white cotton thread may work, using the technique recommended for garments and textiles. Stitch each end of the label so minimal snips are needed for removal. No new holes shall be made. If no technique above will work, use a paper tag or label the enclosure. Taxidermy is typically labeled with a tag around the leg, and also the mount support if present. I like the collections management solutions offered by labeling a coin holder used for glass beads. Typically, the underside of a glass vessel is labeled. Large beads may be labeled with a tag on a string. Locate a smooth area that is not flaking, powdery or decorated. Do not mark glass that suffers from glass disease (weeping, crizzling, etc). Choose a location that will not show during exhibit or photography. Small font size on paper label helps. I think B-72 loves metal more than any other material. Typically, the underside of a metal item is labeled. If the metal item is very heavy, the “back” may be labeled instead. Locate a smooth area that is not flaking, powdery, rusty, decorated, or coated. Musical instruments are often coated, for example. Coins are usually not labeled directly. Edges may be labeled if large enough. Choose a location that will not show during exhibit or photography. Small font size on paper label helps for smaller objects. Apply base coat of B-72, paper label, top coat. Avoid artist acrylics and adhesives containing ammonia with copper or alloys with copper such as sterling silver. Jewelry may be especially difficult to label, even with tiny font size. Redundant tags are helpful. Did I mention I love redundant tags to minimize handling? The back upper right hand corner of a painting is a good place for the number. Large paintings may be marked on diagonal corners. 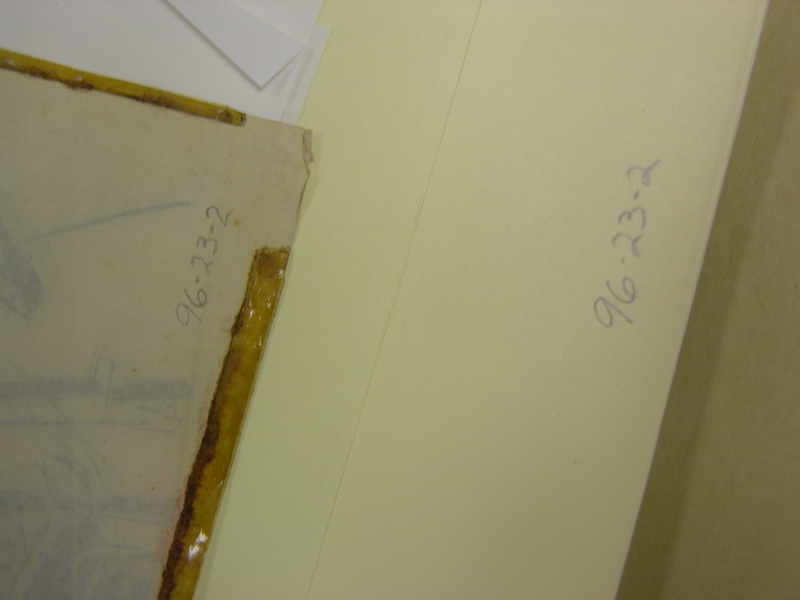 Artworks are sometimes removed from frames, so the back of the painting support is the best location for marking. Select a section of the wooden stretcher or strainer, plain wood if available. Avoid touching the back of the canvas corresponding to the painted area. Label the rigid edges or backing board if the support is not visible. In addition, use a paper tag attached to the screw eye, D-ring or other hanging hardware. This allows a painting to be identified without excessive handling. 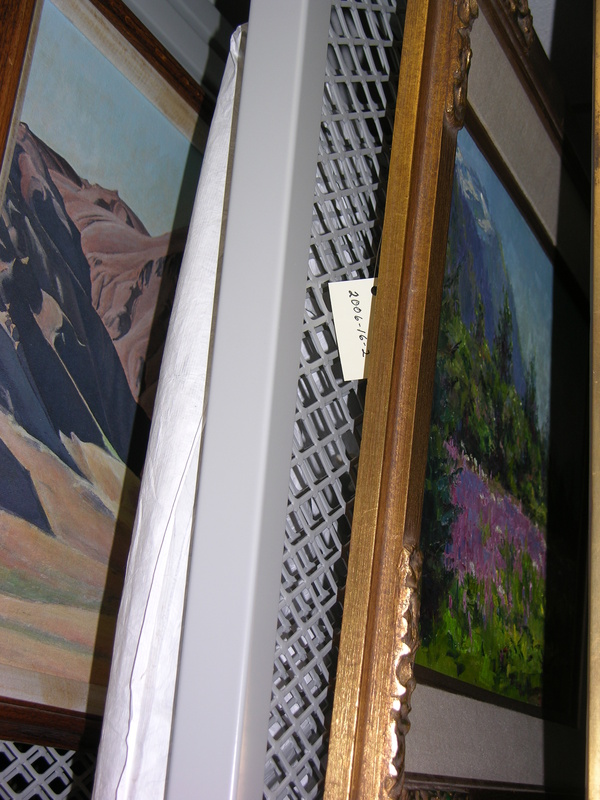 Collector and exhibition labeling/ marking on paintings has a long and important tradition. Avoid removing old labels from the backs of paintings. Number is usually applied to the back upper right hand corner, in a non-image area along the edge. For paper, apply number with a #2 or HB pencil, taking care not to press hard enough to make indentations. Write on a firm surface. For photos made of plastic, use the blue photo pencil. Sometimes, the right amount of dullness on a graphite pencil will also work on plastic but care must be taken not to scratch the plastic. If the plastic has oily fingerprints, plasticizers, or coatings, pencil will not work well. Use a labeled enclosure such as a bag or folder as redundancy and to reduce handling. Acetone damaged all these plastics. Water-based labels often peel off too easily. I prefer tags for plastics. Many kinds of plastic are vulnerable to the solvent acetone used in B-72 labeling adhesive, so this adhesive should not be used. Some older plastics are sensitive to water-based adhesives. It can be difficult to identify specific plastics. Rubber, vinyl, plastics, and synthetic materials should be marked with great caution as removal can cause damage. 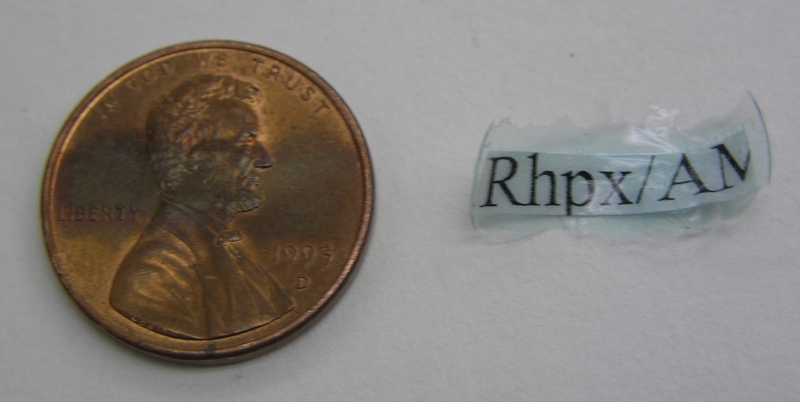 Adhered labels often pop off of flexible plastics. Many plastic items are connected to composite objects with other parts that may be labeled instead. For a completely plastic object, the most conservative recommendation is to only use a paper tag with a labeled bag/ box as redundancy. Enclosures also reduce handling, and many plastics age poorly so the less handling the better. Some museums use water-based acrylic adhesive labels, or B-67 in petroleum distillates, but removal of these labels is not risk-free. 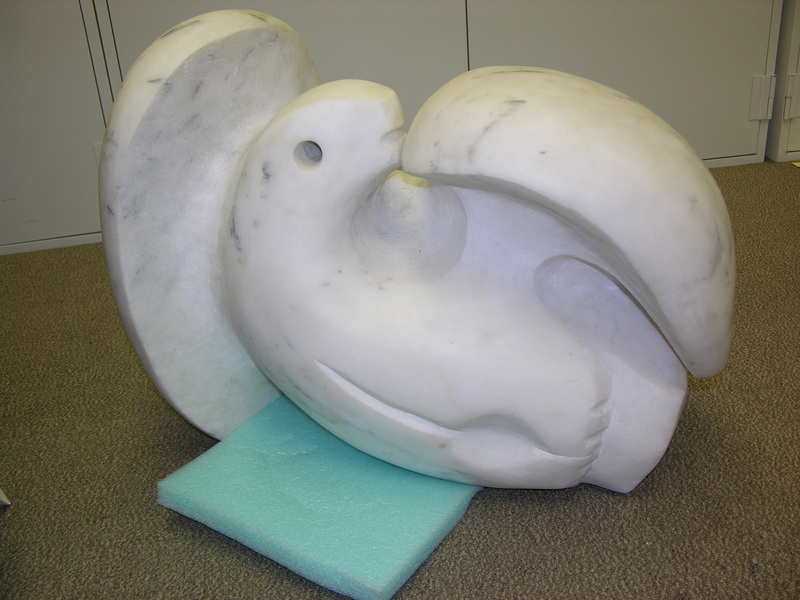 This Melvin Olanna marble sculpture (ASM 2000-6-2) is heavy! Don't put the label underneath, or you risk damaging the artwork or yourself looking for it. Typically, the underside of a stone item is labeled. If the stone item is very heavy, the “back” may be labeled instead. Locate a smooth area that is not flaking, powdery or decorated. 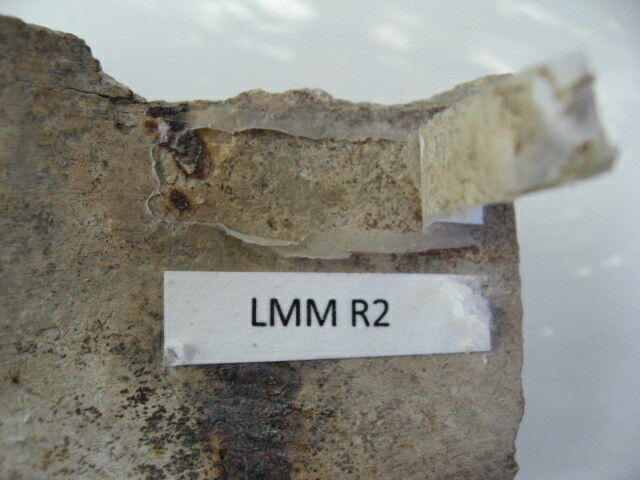 Porous or rough surfaces are difficult to label. Avoid use edges of stone tools. Blank Tyvek tag showing loops at the ends that are easy to snip for removal. These are labeled at the inner back of the collar, but a redundant tag on the hangar reduces handling. For rolled textiles, redundant tags are really needed. 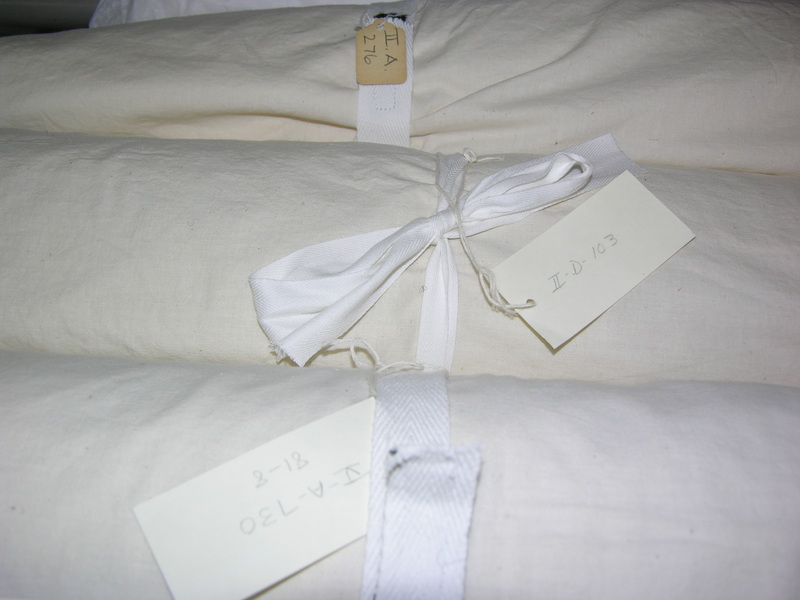 For textiles robust enough and large enough to hold a label, a sewn technique with Tyvek and white cotton thread is recommended. Garments are typically labeled where a manufacturer’s label might be found, such as at the back of a neck or the waistband. Labeling diagonal corners is helpful for large rolled textiles. Choose a location that can be hidden during exhibit or photography. Cut a piece of Tyvek, write the number by hand with a Zig Millenium fade-proof and waterproof pen in the center, leaving room for stitches at each end. Use seams and original stitch holes whenever possible. Second best is to pass the needle between the weave without piercing the yarns. Stitch the label with a loop through two holes at each end so minimal snips are needed for removal. Sharp needles work well to pierce Tyvek, while ballpoint needles are less likely to damage the textile fibers. Each rattle also has its number written in pencil on the pallet that holds it.Redundant paper tags in each dish reduce handling and facilitate locating an item. Wood items are often painted, varnished or otherwise coated. Avoid applying a label to those areas and seek out an inner, underside, or back surface that is bare wood. Locate a smooth area that is not rough, splintery, or decorated. #2 or HB pencil may also be used on wood if the number can be applied without denting the wood and if it may be removed again with an eraser. Pencil, however, tends to be harder to read. 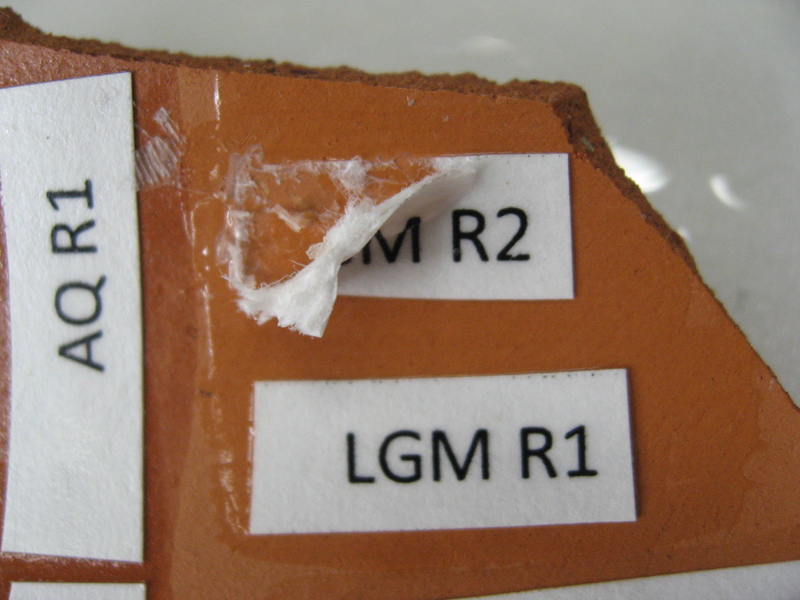 B-72 is the adhesive conservators recommend for museum labeling of archaeological artifacts. Postings on labeling basics and suggestions for assembling a labeling kit are also posted on this weblog. Properly done, the B-72 technique is legible, durable, reversible, and chemically stable. 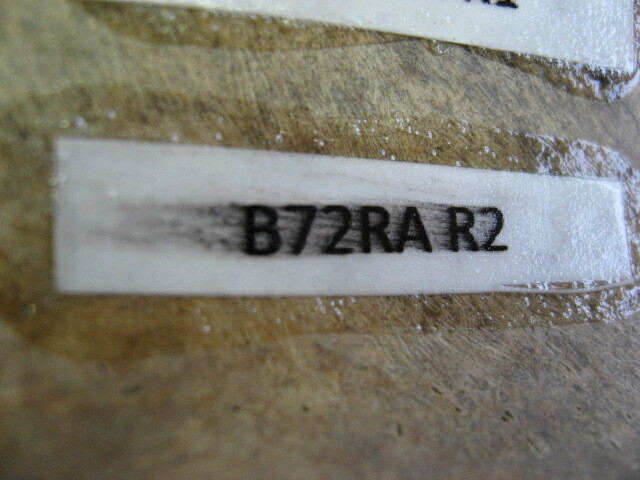 However, the handling properties of the B-72 technique cause frustration, including unpredictable bubbling and the sensitivity of many inks to solvents in the adhesive. There is great temptation to utilize other adhesives in pursuit of better handling properties, ease of application, and local availability. 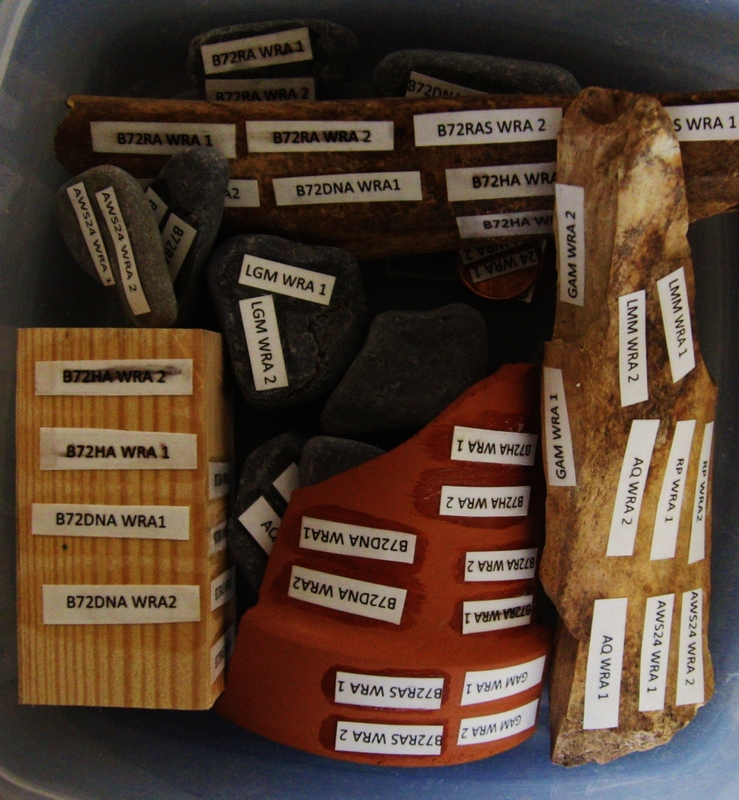 As a follow-up to discussions at the 2010 Alaska Anthropological Association seminar on Collections Curation, several conservators independently tested several popular adhesive alternatives on bone, wood, metal, stone and unglazed ceramic to assess their performance. Here are our observations, with some notes on our methodology if others want to test more adhesives. Gallery of images at the end, you can click to enlarge. Water-based adhesives had better handling properties for application. These included ease of cleanup, single-step application, little odor or fumes, and the ability for the water component of the adhesive to penetrate the paper structure and cause it to drape and conform to uneven surfaces easily. The thicker water-based acrylics and gels (those that were white and thick) also had the advantage of self-positioning easily. The labels stayed where they were placed and did not move readily when brushed with a topcoat. The thinner water-based adhesives tended to pool themselves up (from the water tension) when used on metal samples. Among water-based adhesives, Golden Acrylic Gel had the best application properties of any adhesives tested. However, many of these properties that are nice for the short-term convenience of the person applying the labels come at a long-term trade off for the best interests of the artifact. Some corrode metal, some come off easily in moist conditions, and some are hard to remove without damage to the artifact. Solvent-based adhesives tend to be more difficult to apply. Disadvantages to the person applying the label include stickiness, more complicated cleanup, possibility of smearing inks or bubbling, disagreeable odor or fumes, poorer ability of the paper label to conform to uneven surfaces, and tendency to slip around when placed and brushed with a topcoat. Application with adhesive of higher concentration gave a better result in conforming to uneven surfaces and corners staying down, but has sometimes been reported to be associated with bubbling. Using a different topcoat with a B-72 barrier layer made the labeling process take longer, required more elaborate cleanup, and petroleum-distillate based topcoats were sticky, smelly, drippy and took a long time to dry. 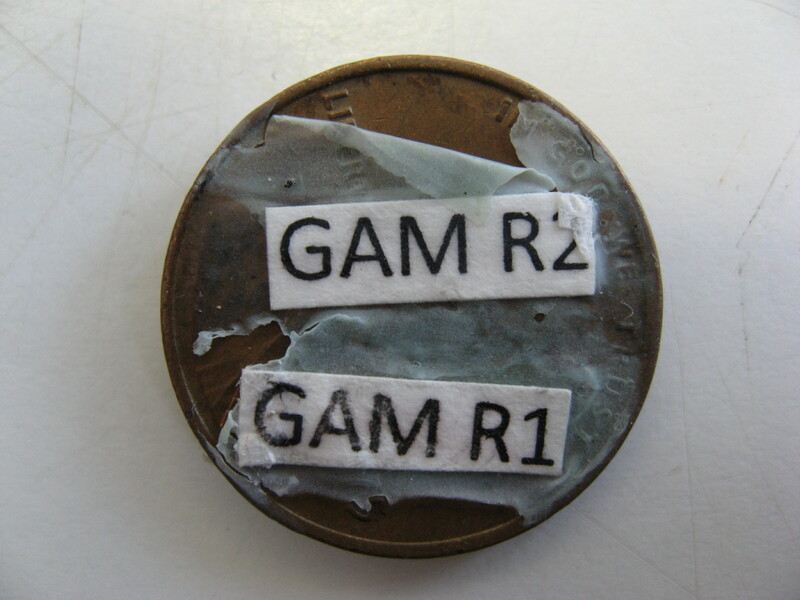 However, the solvent-based adhesives tended to be better for survival of the label and removability without damaging the artifact. To put it bluntly, the trade-off is: ease of application for the human comes at the cost of optimum preservation of the label and artifact. B72 (marketed as Acryloid or Paraloid B-72) is a solvent-based acrylic resin. It was tested in both reagent grade acetone and hardware store acetone. 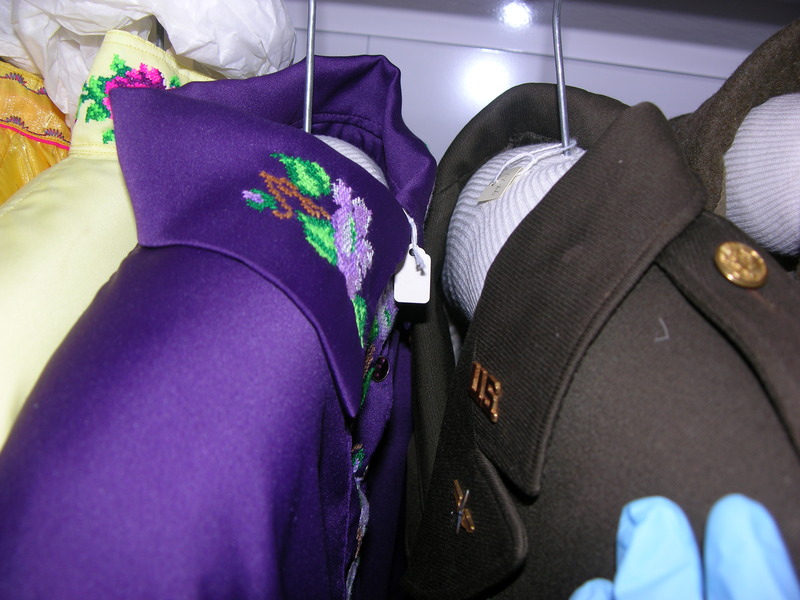 Because B-72 is such a desirable barrier layer, alternate topcoats were explored to solve the smearing problem. Soluvar is made of acrylic resins B67 and F10 in petroleum distillates, used as a picture varnish. Regalrez is similar, but made of low molecular weight resins in petroleum distillate. While solving the smear issue, the alternate topcoats caused other frustrations. Does not make ink smear the way acetone-based B-72 can. 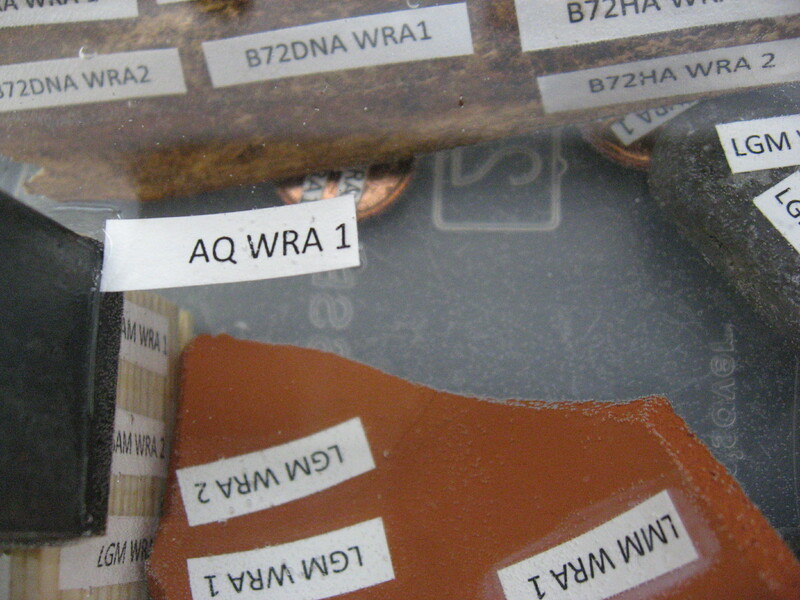 At the Cleveland Art Museum, conservator Sam Springer reports that printed labels are first given a coating of Aquazol to prevent the ink from smearing. At the Alutiiq Museum in Kodiak, Alaska, registrar Marnie Leist reports they use B-72 as a barrier layer and art store acrylic as the topcoat. Water-based acrylic media including Daniel Smith Acrylic, Golden Fluid Matte Medium, Golden Gel, Golden Self-Leveling Gel, Liquitex Gloss Medium, Liquitex Matte Medium were tested as examples of art store acrylics. Golden Gel is used by several museums in Alaska. Because water-based adhesives are more user-friendly than the solvent-based adhesives, conservation-grade water-based acrylic adhesive Rhoplex (also marketed as Primal) 33 or its replacement B-60-A was tested as an alternative to B-72 and art store acrylics. Rhoplex is often used as a stone and plaster consolidant. Note that WS-24 is a different product. Can corrode metal, adhesive turned yellow-green on aging. Because water-based adhesives are more user-friendly than the solvent-based adhesives, conservation-grade water-based acrylic adhesive Acrysol WS-24 was tested as an alternative to B-72 and art store acrylics. It is sometimes used as a consolidant for waterlogged archaeological bone. Note that it is also sometimes sold as Rhoplex or Primal WS-24. Because water-based adhesives are more user-friendly than the solvent-based adhesives, conservation-grade Aquazol (a non-acrylic water based plastic) was tested as an alternative to B-72 and art store acrylics. It is soluble in either water or alcohol. It is commonly used as a paintings consolidant. AYAF is marketed pre-mixed as “PVA Marking Varnish” by MuseuM Services Corporation. AYAF is a solvent-based polyvinyl acetate (PVA) resin equivalent to the European products Mowilith 50 and Vinylite A. It is most often used as a consolidant for various materials. Metal: Penny coins dating after the year 2000, fresh from normal use without pre-cleaning. Stone: Dark gray slate from a museum diorama. Ceramic: Plain terracotta flowerpot, had been in outdoor use one summer. 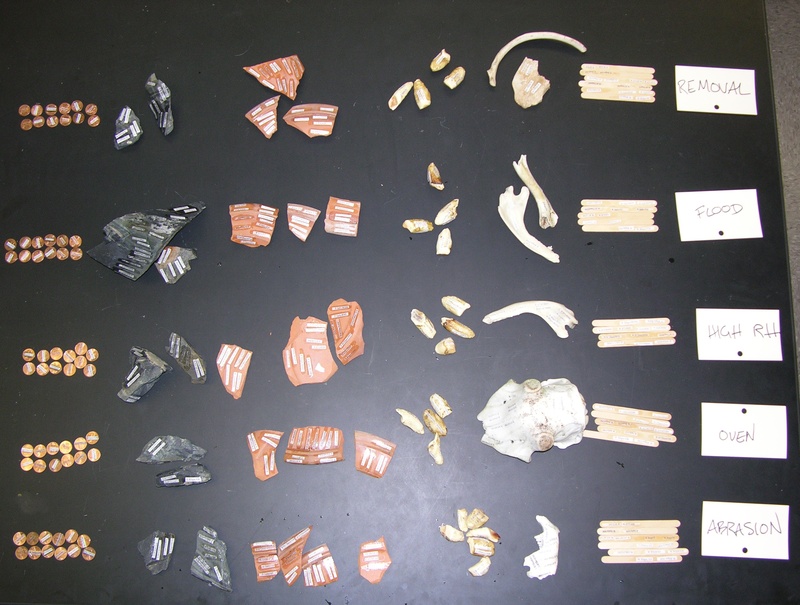 Bone: Mammal, mainly beach finds. 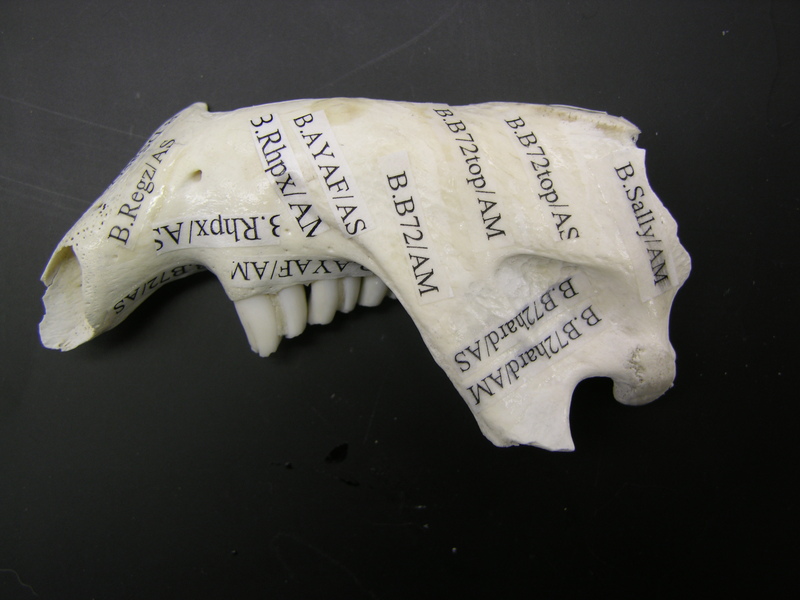 Tooth: Mammal, from the museum educational collection. Wood: Plain popsicle sticks from craft store. The tests involved submersion in a vat of water over a weekend (to simulate a flood incident), sealing in a bag at 80%RH for 24 hours, aggressively shake samples of each substrate together in a ziplock bag, aggressive abrasion with a dry toothbrush, and heating in an oven. pH tested by adding a drop pHydrion pencil in solution to the wet adhesive Insta-check pencil “lead” dissolved in boiled, distilled water (see Odegaard, Carroll, Zimmt 2000). 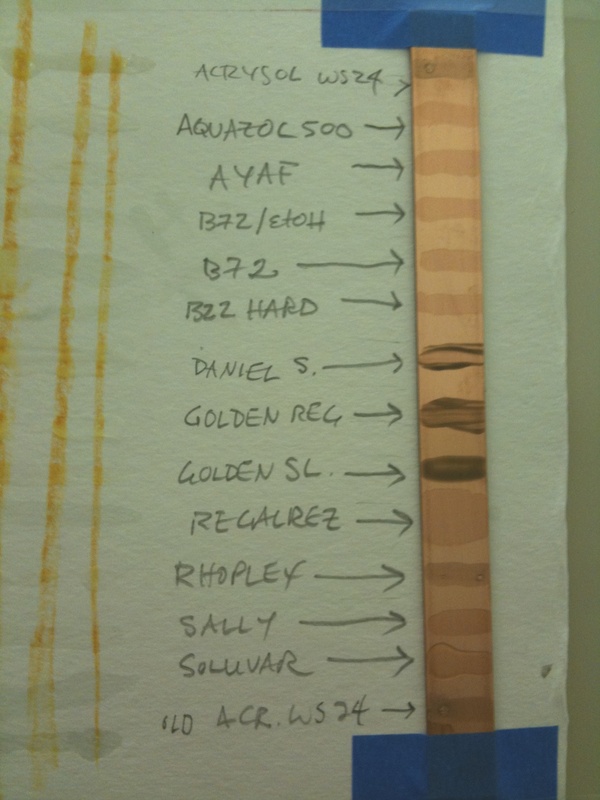 Strip of pure copper painted with adhesives as a separate test for copper corrosion. Tested paper label dipped in adhesive alone for durability. Removal techniques tested were dry scalpel removal (also called “mechanical” removal), water on a cotton swab, and acetone on a cotton swab. 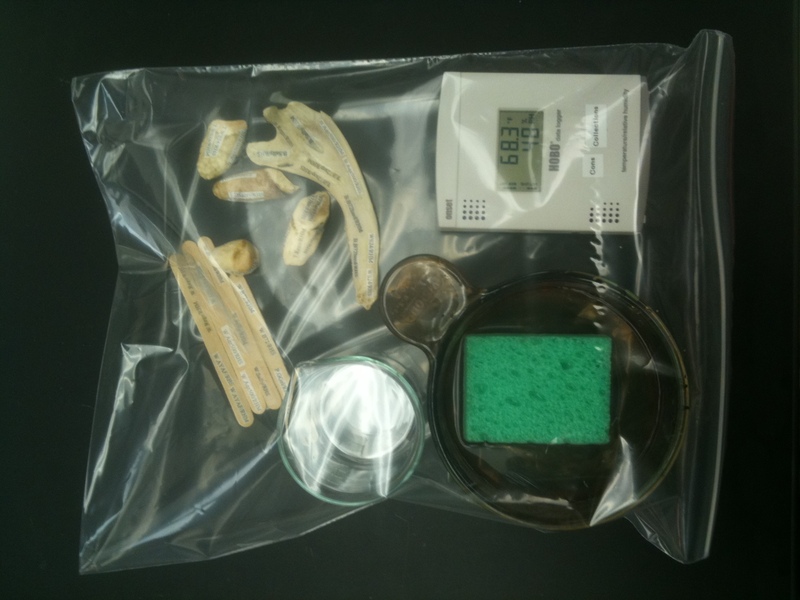 The tests involved submersion in a vat of water for two hours (to simulate a flood incident), sealing in a bag at 80%RH for 72 hours, aggressively shake samples of each substrate together in a ziplock bag, aggressive abrasion with a dry toothbrush, accelerated aging in over for 4 days to simulate 12 years, pH testing with pH strips using dried label mashed in water. Solvent removal with cotton swab, poultice or solvent gel, mechanical removal with scalpel, bamboo stick or dental tool. B-67 in acetone using Aquazol-coated label. 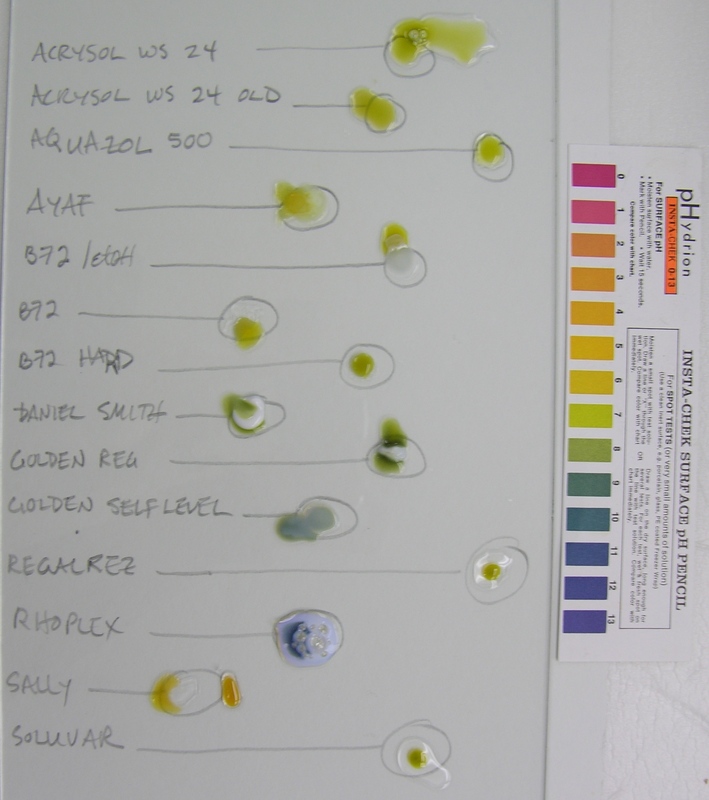 For some tests, the “Aquazol-coated label” was first spray-coated with two coats of 12% Aquazol 200 in reagent grade ethanol and allowed to dry. This is to prevent smearing of the ink. 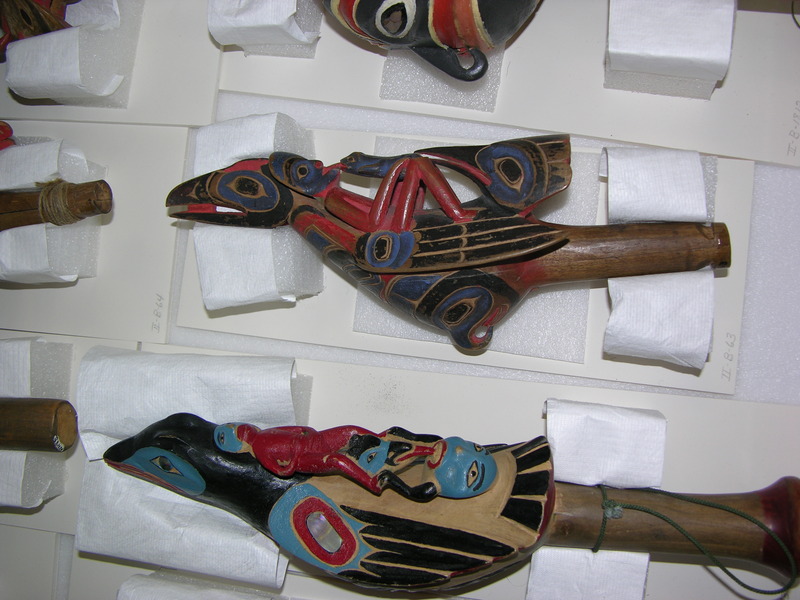 Big thanks to our Alaskan museum colleagues and to the folks who discussed this with us on the American Institute for Conservation Objects Specialty listserve. Apologies if I miss your name, but here’s my best shot: Helen Alten, Barbara Applebaum, Victoria Book, Scott Carrlee, Chris del Re, Dave Harvey, Katie Holbrow, Rick Kerschner, Steve Koob, Marnie Leist, Susan Lansing Maish, Katie Myers, Teresa Myers, Steven Pickman, Dennis Piechota, Monty Rogers, Linda Roundhill, Patrick Saltonstall, Monica Shah, Tony Sigel, Julie Unruh, and Jim Whitney. 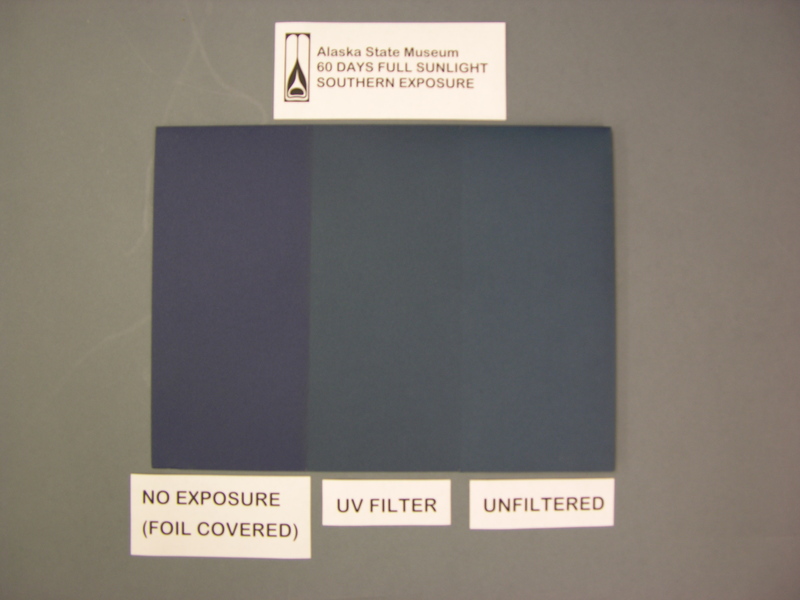 This plain paper folder was placed in a window with southern exposure at the Alaska State Museum for two months. The far left side was covered with aluminum foil to block out all light. The middle third was covered with UV filtering plastic film. This film was tested with a UV light meter to insure it was effective at blocking ultraviolet light. The far right hand side of the paper folder was left completely exposed. On my computer monitor (and on the real folder) you can see a slight difference in the faded blue color between unfiltered and filtered, but both are drastically faded from the section that was not exposed to light at all. Hopefully this is evident on your computer monitor as well. While filtering UV light does eliminate a dangerous wavelength of light that is contributing to deterioration beyond just fading, if you seek to prevent the visual change of your colors from light fading, UV filtering will not give you the protection you need. All light is damaging, and fading is cumulative and irreversible. To prolong the vividness of colors, you must bring light levels down and limit overall exposure, not merely filter for UV light. You are currently browsing the archives for the REFERENCE category.